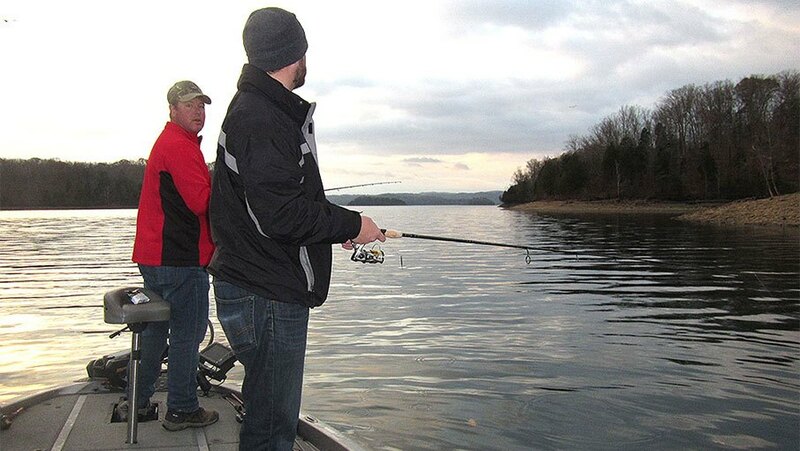 Chad Miles (left) and his brother Matt fish Dale Hollow Lake last December. The darkening clouds in the background portend the coming low barometric pressure front that prompted a morning of productive early winter fishing for smallmouth bass. This is the fifth of a series of articles detailing essential outdoor skills to learn before the warm winds of spring arrive in Kentucky. With the frenetic pace and busy schedules of modern life, the saying is true more than ever. However, if you only have a few weekends each spring to fish, the experience yields more stress reduction, enjoyment and memories if the fish bite like crazy. Studying the long range forecast before planning a fishing trip and looking for the right trends helps bring you a glory day of fishing instead of a day of a thousand casts without a bite. Several factors play into what makes ideal environmental conditions for fishing: barometric pressure, wind direction, sunlight and precipitation all play a major role. Barometric pressure is a measurement of the weight of an entire column of air pressing down on the Earth. Approaching storm fronts ease this weight, resulting in low atmospheric pressure. The old fishing adage that fish bite best before a storm is true. High barometric pressure stems from a large mass of air that is slowly descending toward the Earth’s surface, while low barometric pressure is the opposite scenario. The rising air of a low pressure area cools and releases the humidity trapped in the air, causing either rain or snow. Low pressure systems bring with them environmental conditions conducive for predator fish to feed such as increased winds, dark, cloudy skies and precipitation. These factors decrease light penetration into the water column, providing a better environment for predator fish to ambush prey. The lower barometric pressure also exerts less force on the water’s surface which may trigger a feeding frenzy, although some debate exists on this point. However, there is nearly universal belief that approaching low pressure frontal systems provoke fish into feeding. The shimmering bluebird days following a low pressure system really hurt fishing in late winter and early spring. Fish hold tight to cover, grow lethargic and often hunker on the bottom awaiting better conditions, especially in clear water lakes. Many believe the force of the higher air pressure on the water’s surface is a catalyst for this behavior. In the Northern Hemisphere, air descending from high pressure flows out in a clockwise direction, often bringing winds from the north and eventually the east. The old saying “Wind from the east, fish bite least” has some basis in fact. The descending air of a high pressure system does eventually bring good fishing in spring. Air moving toward the Earth’s surface warms while doing so; this warming retards the formation of clouds, bringing clear skies with lots of sunlight. Several apps for smart phones predict the barometric pressure over a two or three day period. Miles often consults these apps when planning fishing trips. The National Weather Service offers excellent long range weather forecasts on its website at www.weather.gov. The later sunsets of mid-February indicate that winter’s cold grasp is lessening and spring is on the way. If you have a choice of planning upcoming fishing trips, the day before a low pressure system or three or four days afterward are best.